The race for governor is now wide open. Wisconsin Governor Jim Doyle has decided not to seek a third term, although he concedes it&apos;s a decision he&apos;ll probably regret many times in the next year and a half. "But I am not going to pull a Brett Favre on you," Doyle told a press conference at Madison&apos;s Randall Elementary School. "I am announcing my decision now to allow other candidates to step forward, and to get going." There could be several Democratic candidates: Lieutenant Governor Barbara Lawton has announced her intention to run, while Congressman Ron Kind said he&apos;s considering it. Milwaukee Mayor Tom Barrett and state Senator John Erpenbach have also been mentioned as potential candidates. GOP candidates Scott Walker and Mark Neumann have already geared up their campaigns. Despite slipping poll numbers, Doyle thinks he could have won a third term. "I will just simply point out, and I don&apos;t try to be bragging here, but I&apos;ve never lost an election," said Doyle. "I think we would have done very well." Doyle says he fully intends to serve out the remainder of his term, and get a lot accomplished in that time. "Over the next year and a half, I will be the governor, and not a candidate, and I believe that without the politics and the campaign, we can get a lot done over this time." Doyle, a Democrat who was first elected governor in 2002, refused to speculate about what his next move might be, after he leaves office. Told indicated that he has spent a lot of time thinking about serving just two terms. "When I first ran for governor in 2002, Jessica and I assumed that, if I was fortunate enough to be elected, it would be a two term commitment," said Doyle. "I believe that a governor should limit him or herself to terms. This is the norm in this country. The president and most governors are limited to two terms by law. Most other states have followed this tradition." Doyle, who served three terms as Wisconsin Attorney General prior to being elected governor, noted that he is already the state&apos;s longest serving Democratic governor, and will be its second longest serving overall when he completes his term. 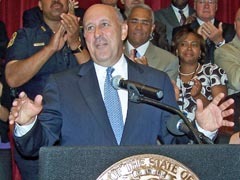 The governor ticked off a list of his accomplishments in his current term, and stated his conviction that a longer list will be written between now and January 2011, when the next governor is sworn in. "Let&apos;s get to work," he said. Doyle&apos;s second term has been a difficult one. The state budget which he signed in June was completed on time, but was balanced only through the use of millions of dollars in one time federal funding. Doyle was also forced to reduce spending and require furloughs for state employees. The state&apos;s industrial economy sustained significant hits, with the news that Janesville&apos;s GM plant and Chrysler&apos;s Kenosha engine plant would cease production, while Milwaukee based Harley-Davidson has announced hundreds of layoffs. While a governor exercises little control over a state&apos;s economy, Doyle would have had to defend his record of retaining and creating jobs during a reelection campaign.